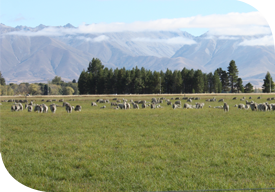 Fortunes for coarse crossbred wool growers improved during the autumn, largely driven by increased demand for New Zealand wool from several of China’s largest mills. Weakening of the New Zealand dollar against the United States dollar also aided the better returns. Chinese manufacturers, who in recent years have typically purchased around 50 per cent of our wool clip, significantly reduced buying around 18 months ago, which drove returns for wool down to perilously low levels. By the start of 2018, the mills had depleted their stockpile, and China increased buying to more normal levels. Through March and April this year, more than 50 per cent of the wool exported from New Zealand was bought by China. Returns have responded accordingly, with price increases since the start of 2018 exceeding 20 per cent for most wool types. While the shortage of demand beset the sector, several growers and exporters held wool in stores and sheds in New Zealand. That wool is now coming onto the market, and selling. However, wool held in store does tend to deteriorate in colour, in which case it will be discounted in price compared to better types. Additionally, some of this season’s North Island wool is showing significant signs of colouring due to humid climatic conditions in the north during late spring and early summer, which also has the same negative effect. That aside, some of this season’s recently shorn wools are of a very high quality. Expectations are that prices for coarse crossbred wool have bottomed out and, compared to the low values that farmers have endured in recent years, the outlook appears more encouraging. Crossbred and strong wool comprises between 80 and 85 per cent of the New Zealand wool clip, with the balance being fine wool. While autumn is outside the regular season for trade in New Zealand fine wool, our market is influenced by what happens in Australia, where the product is under heavy demand. This suggests that when the fine wool trading season resumes from July through to December, fine wool growers can expect a bright outlook and positive returns.